I wish I WERE the best. Myriam Scuttlebutt, to be exact. So Scuttlebutt thought Rei was going to confess to Juniper about his true age and job? Hmm, that doesn't exactly rule out Rei confessing to Juniper that he loves her in the future, doesn't it? Too bad that if he does, he's more than likely to be rejected, for obvious reasons. 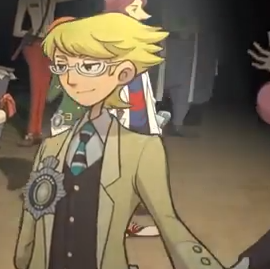 Also, is this the only case where Fulbright appears in but doesn't give his usual testimony? I would have never guessed a case involving a student council president living in the mountains, a complete failure of a 25-year-old student who's good at archery and works as a construction worker, an old man who carries a staff, looks like Zeus and throws chalk at misbehaving students, a girl hiding herself in a cardboard box and another girl crossdressing as a boy who acts hot-blooded but in truth extremely feminine would be so wacky. N-No, all Scuttlebutt/Atsume wrote in the article at the beginning of the case is that if Rei won, he would make a "confession" to Shinobu. It's implied throughout the case that it's a confession of love, but at the very end of the case Rei says he was merely going to confess his true identity. I don't think Rei has feelings for Shinobu, or will develop them. Rei, Shinobu and Chishio's friendship is something that they all cherish, and that's all the three of them are--friends. Good point there. I guessed I assumed too much out of that rumor. And since Scuttlebutt is wearing the same outfit as Juniper, I assume that she also wants to be a judge? Now that I think about it, does the game ever say how long Ichiro has been principal of the academy for? I was wondering who the principal was when Yumihiko graduated the academy with his perfect grades being the result of bribery from his father. After all, Rei's perfect grades were obtained by his parents bribing Ichiro. According to Ash, the uniforms merely correspond to male/female, not judge/attorney/prosecutor (Chishio isn't wearing a uniform, and this is also why Yumihiko and Rei have the same outfit despite the former being a prosecutor and the latter being an attorney (student)). 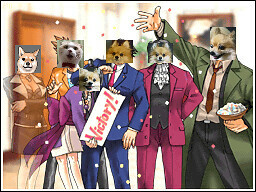 ...Although Scuttlebutt IS actually in the judge class. Of course, the outfit thingy is just a theory of mine. ...Although Scuttlebutt IS actually in the judge class. Imagine a judge sneaking around the courtroom under a cardboard box and taking photos of people. The court lobbies would never have the same kind of privacy again. Of course, I expect her to have matured out of that by the time she graduates, but heck, old habits die hard. Could it be possible that the uniform colors are related to seniority or advancement in classes? Like, people in blue uniforms are second year students and red are third year or something like that? I imagine it would be in a box of gavels. Like, she just buys them in bulk to get a box with a giant gavel on it so people still know she's a judge. Hmm... There's no reason it couldn't be, but I think Shichio+Rei+Shinobu are all the same age/grade. "Court is now in session." "I am now your new ruler!" Oh dear. The AA games would never be the same again as a talking box as a judge. I guess it's just an unfortunate coincidence that all the students who wear a blue uniform happen to have families who bribe people. Finished the case last night, and honestly...I didn't like it that much. The killer was really obvious and I didn't care for the subplot. The Chishio reveal bothered me. The whole idea of "my parents raised me as a boy so I could be in law" is so archaic and unnecessary, considering in the PW world there have already been prominent female judges and lawyers. For there to be no explanation other than the implied "Chishio's parents are sexist assholes" was irritating. And it especially bothered me that everyone's immediate reaction was "He's too loud to be a girl!" Even Apollo! Get out from under your gender stereotypes, people. It made me go back and look at the variety of female characters vs male ones in the series. Apparently we need more loud and/or butch ladies to keep these guys on their toes. But anyway, other than that, I found the whole thing kind of hard to swallow. Rei being held back 7 times and no one in school knows? He must have been held back in a previous school because otherwise how could they have all met as freshmen? And then he starts magically acing tests and thinks he a genius? I mean, good for him, as a 25 year old guy starting his relationship with teenage girls early on in his law career, but he kind of skeeved me out, since he was lying to them about it. Then you have Ichiro, who is blatantly teaching students to lie, cheat, and forge evidence - how does the school have any credibility whatsoever? Just saying "~dark days of law~" isn't an explanation and I don't see how proving that he was accepting bribes ruins his reputation any more than he's already doing himself. After everything that went down in GK2 you'd think they would have cracked down on corruption in the law world, but apparently that was just the beginning. What the hell has Edgeworth been doing all this time? Though on the other hand, I kind of like the possibly unintended implication that Ichiro was teaching his students to follow the example of famous lawyer Phoenix Wright, who was until recently a proven forger. Also on the positive side, I liked the small bits of Phoenix in the case. Athena and Apollo's relationship is growing on me, even if Athena herself doesn't particularly impress me. And I really liked Simon in this case. When he walked out of court I laughed, and Ban tasing him never gets old. Though I still have figured out why they're letting a convicted murderer try cases when Klavier was right there on the scene and could have prosecuted it himself. Oh well. But anyway, other than that, I found the whole thing kind of hard to swallow. Rei being held back 7 times and no one in school knows? He must have been held back in a previous school because otherwise how could they have all met as freshmen? And then he starts magically acing tests and thinks he a genius? I mean, good for him, as a 25 year old guy starting his relationship with teenage girls early on in his law career, but he kind of skeeved me out, since he was lying to them about it. They called him a 'ronin', so I thought maybe it wasn't that he got held back 7 times, but he failed the entrance exam 7 times? Then you have Ichiro, who is blatantly teaching students to lie, cheat, and forge evidence - how does the school have any credibility whatsoever? Just saying "~dark days of law~" isn't an explanation and I don't see how proving that he was accepting bribes ruins his reputation any more than he's already doing himself. After everything that went down in GK2 you'd think they would have cracked down on corruption in the law world, but apparently that was just the beginning. I got the feeling that the whole "teach kids to be terrible people! 8D" thing was a bit on the down-low. What the hell has Edgeworth been doing all this time? .......The only reason I replied to all that was just for that last spoiler tag. I'd like to add that they're no ordinary glasses. Apparently, the guidebook confirms that the uniform designs changed over the years, and that's how during GK2 prosecutors used to wear blue (what a convenient explanation, Eshiro-san... ). Ah. At least they acknowledged/explained it somewhere. How long did Rei stay at the academy anyway? Or at least how long he claimed to be at the academy before the whole "actually 25" reveal anyway? Because I'm wondering if he actually stayed at the academy for 7 years straight. And Rei, a construction worker? Well, that explains all the fanart of him wearing a hard hat. And the blog entry apparently talks more about development of the character so can anyone translate it? He never said how long he stayed at the school or revealed how old he was. I think it's safe to assume that he didn't linger on campus for seven whole years, but messed up his record enough to be on academic probation. Mr. Fukuta from the scenario team mentions an example case that was scrapped. It took place in a little mountain village that worshiped the Tengu. Near its outskirts was a western-style castle, which was rumored that a vampire resided within. After the vampire was killed, a witness saw a Tengu appear from the scene of the crime. Well, that's fine and dandy, but the issue comes with a certain piece of evidence at the scene: a long and bright red object. At first glance, it seems like a chili pepper. In actuality, it's supposed to be the broken nose of a Tengu. Yet, since Apollo isn't very good with mythology, he and Athena head off to look for nearby restaurants that work with chili peppers. Later on in the case, when Apollo looks for that turnabout, he comes upon the realization that it's actually the Tengu's nose. In this case, it ends up "limiting upon the player's imagination", so to paraphrase. Only those who are more familiar with Tengu legend and folklore would better understand the connection made. Because they always write the scenarios so that the majority of players can understand them easily without needing extra trivia knowledge, this case idea was scrapped. Mr. Fuse (?) from the scenario team describes Chishio as someone who completely lives up to his name. However, the team had some trouble with exactly how they could describe someone like him. They went with several types of introductions, to no avail. Then, Mr. Fuse (?) the art director (not related to the other Mr. Fuse) drew up Chishio based on such suggestions. He added the chest cast to let Chishio make squeaking sounds and sweat a lot to add to his hot-blooded image. (The conversation between the two men is pretty funny because Yamazaki can't tell which one is talking.) In any case, the image stuck. Somewhere along the lines, his testimony consisted of a whole load of grunts and yells. Needless to say, it was scrapped. Next week is even more stuff from the scenario team. This case was crazy as hell. Professor Means and Hugh O'Conner were my two main suspects. I'm still laughing about Professor Means in court! The random chalk board and the violent scribbling! Aristotle's glare, teeth bared, throwing chalk at the defense and scolding them! LMAO! And then writing down alternate forms of punishment as he was found guilty, and the audience booing him. At this point, I don't even care about his motives or methods. Okay, not true. He's twisted and obviously wrong about a lot of things, but damn if he wasn't hilarious. Left field, meet more left field. Hugh did surprise me about his true age, though I did think Juniper's two male friends looked a bit far apart in age, even though they were supposed to be 18. Though I suspected Hugh for a bit, eventually I figured he must be guilty of something else. It was touching when they all revealed they were still wearing their proofs of friendship. I keep getting annoyed when they point toward this being a fairly recent occurrence, something that started only years before. There were plenty of corrupt prosecutors, defense lawyers, and policemen long before this period of time. It could be "those specific events" (which I won't say here since I can't be sure either is even mentioned in 5-3) made things worse, but they were not the cause. Finished the case. I really enjoyed it - there was a lot going on, but it came together well at the end. Onto the cases we hadn't seen before release! How did Rei hurt his hand? I guess I... read over that part. Also, can someone explain Ichiro's breakdown to me? Blame Scuttlebutt for Hugh hurting his hand. Her "safety" feature on her mock trial script was a knife popping out if you opened it incorrectly. What, so he can hide the fact he failed that much as a student? I was wondering, before the big reveal, did Juniper and Rei knew that Chishio was really a girl? And I'm guessing that the love triangle rumor was created by Scuttlebutt, right? If so, why? 1. Because he didn't know. His parents were bribing Means into making his grades good. 2. They didn't. She was planning to announce it to the school later, and talked to the victim about it. 3. It was, because she wanted to be part of the group. How does the "Hugh O'Conner is a goner" joke work in the japanese version? "Koroshite yaru!" -> "Kora! Shizuya Rei!" "I'm gonna kill you!" -> "Hey! Shizuya Rei!" Can you give the japanese script of the final breakdown? Off topic but how does the 'I hope it's not a SNAAAKE!' joke work in the japanese version? Am I annoying you with the localization questions? Don't worry about it. If you hadn't asked them, I suppose others would anyway. The snake joke is only in the English ver. The Japanese audience would understand the MGS reference, though. EDIT: Wait, you meant the English translation, right? As soon as Professor Means changed faces, I lost it... but didn't think he'd get even more hilarious by writing alternate forms of punishment for himself. What is the japanese version of Mean's catchphrase 'I, professor Means always say what I mean and I mean what i say by all means' and how do they say 'the end always justifies the means'? Leave it to localization to make the most out of a single pun. There's no Japanese equivalent, since "Shinji Ichiro" is a perfectly justifiable name (pun intended). "手段を選ばぬ" is close enough to "by all means", so using "end justifies the means" is an acceptable substitution. I feel so loved by the localization team. I have a small question. Could someone explain how the cloak of the Lamiroir costume was supposed to be made? Because the way they explain it in the game (something about phosphorescent paint and making holes), I don't understand how it works. Two layers makes sense... I'm going to guess the inner layer was thin enough to let the paint show through? I just replayed through the case and I thought the ending wasn't really explained properly. 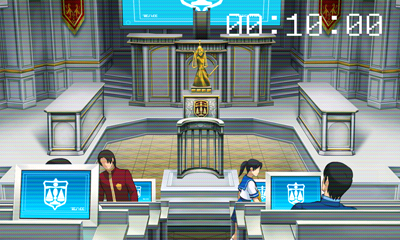 After Athena proved that it was possible to use a dead body and a staff to emulate a Mr Wright Statue, they just skipped to the verdict without stating that Professor Means probably skipped the mock trial to get his staff back/plunge an arrow in THEN go up to the art room to send the statue down. Anyone else felt this way? I just finsished this case yesterday, it was very interesting. There were twists galore! Robin's actually a girl? Hugh's 25? Means' transformation in court? Woah. Speaking of the Robin's true gender, did anybody else kinda assume she was a girl from the get go? I think I was more surprised to her she was a he earlier in the case. Even with the brace on she looks so girly! Means' animations with the blackboard were also fantastic. I assume his design inspiration was a Grecian statue, so seeing that little crack above his left eyebrow and his hair like an ancient warrior's helmet was really neat. His breakdown was brilliant too. Speaking of Means, did anyone else suspect him early on? When I heard the talk about his educational policy beings about results over truth, I felt that the was some bad blood between him and Courte and that he was a possible suspect.